Our arsenal keeps growing. We already own a pretty good quality bow and arrow and several AirSoft guns; for those of you with pacifist sons or daughters only, these are “toy” weapons that shoot little round pellets, which are neither soft nor biodegradable, despite the claims on the ammo bag. Now my 13-year-old son is angling for an Air Gun. As far as I can tell, this is a euphemism for “BB gun” designed to make it sound more benign: just gentle little puffs of air occasionally interrupted by piercing metal projectiles. For this latest obsession, I blame YMCA camp. My son ranked the overall sleepaway camp experience a 6 out of 10, but the riflery class got top marks. Apparently he’s a pretty good shot and earned several awards; I don’t know if that makes me feel better or worse. But what really won him over was the riflery counselor, an accomplished marksman, hockey player and all-around resourceful good guy–who also happens to be a staunch Democrat. He wears an Obama belt, my son said. This is just the sort of role model I’ve always dreaded. In the past, we could temper his militaristic streak by tarring him with our family’s worst slur–“Republican!”–and accusing him of kowtowing to the NRA. But now he’d found a totally cool, gun-slinging, ammo-packing, laser-eyed, steady-handed Obama supporter. He could have it both ways. It made me long for the days when the only views the kids had were ours. 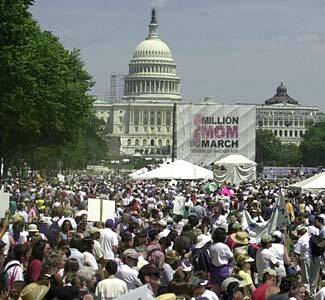 When my son was two and a half, I dragged him and his big sister through a driving rainstorm to Washington so we could attend the Million Mom March, an anti-gun Mother’s Day rally on the mall. This was in 2000, a year after Columbine; I was working for Newsweek at the time and conducted an interview with three Scottish mothers whose kindergarten-age daughters had been killed in a school shooting in Dunblane four years before. They had come to Washington to show their support. As the mother of young children, an animal lover, and an unrepentant pacifist, I identified strongly with their cause. I couldn’t envision a single situation that I thought a gun would benefit. I still can’t. But what’s a parent to do when your child loves something you don’t, whether it’s guns, eyebrow piercings or Republican politics? Oh, if only I had video of that day on the mall! My son leaped out of his stroller, clutching a hot dog, and joined a small line of children giggling and chanting, “No more guns! No more guns!” I think he was even holding a sign. His inner Rambo began to emerge soon after. Driving in the car two years later, he grabbed a graham cracker, took a few strategic bites, and said “Look! It’s a gun!” before pointing it at my head. From there we moved, at his persistent urging, into water pistols and cap guns, and then eventually to AirSoft. At first there were all sorts of rules–no pointing them at anyone’s head, no using them without an adult at home, no guns in the house. But before I knew it there was a rifle propped on the family room couch, and little white pellets rattling around the dryer and stuck in the cracks between our old floorboards. Posses of boys I couldn’t recognize through the goggles and camouflage gear were sneaking regularly across our back patio. My son was so desperate for a constant shooting companion that when his little sister turned 8, he bought her an Airsoft starter pistol–in pink. I remain staunchly opposed to the acquisition of the “Air Gun.” But I am well aware that I once felt the same way about the cap gun, and the AirSoft rifle. Banning weapons is a slippery slope, as any Republican will tell you. I even know a couple of Democrats who might say the same. This entry was posted in Boys will be boys, Family life, Kids, Parenting, Teenagers and tagged air soft, Democrats, guns, NRA, riflery. Bookmark the permalink. This made me and Lilli laugh out loud a bunch of times! Excellent! Love this blog, Sue. Reminds me of when I discovered my “inner Rambo” at the first laser tag party I attended with Jack… ah the pre-parenting certainties we used to hold! Ahhh, yes, we are related. Can truly identify with all you say. 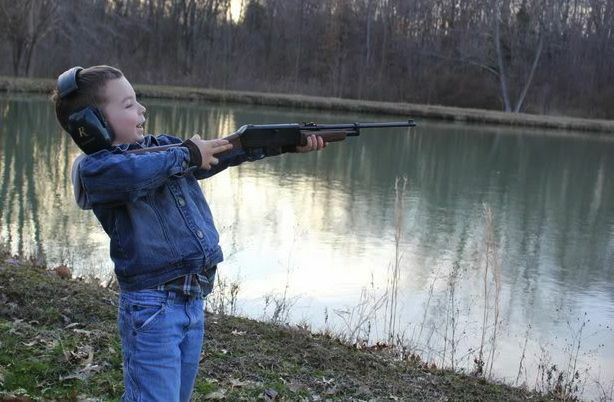 My boys were never allowed to aim any gun above the waist (when Mom was around). I would have loved to have been at the Mother’s Day rally. And I wish now that guns could be washed from the face of the earth. I have to admit to childhood fun with cap guns, though. I think I really liked the smell of the burning caps more than anything. Now, it’s sort of like fishing – don’t understand what the attraction was, and am ashamed that I took any interest whatsoever. I really enjoy reading your blogs, Sue. Much love to you. While I highly respect your passion and awareness about this issue, I would strongly caution you and many others to wary of the ‘all bad’ gun stigma that I find rampant in today’s society as a result of truly horrific violent acts committed by criminals with firearms. There is indeed a positive side to firearm ownership, sport shooting, and hunting. As you may or may not know I was raised by staunchly democratic parents in an entirely pacifist household with no hint firearms present throughout my youth. However, I too went to a summer camp much like your son in which I completely fell in love with shooting small caliber .22 rifles. My parents, though moderately horrified, recognized my excitement and looked for an appropriate avenue to pursue this new found passion. My mother contacted a local friend who’s husband is an editor for the world renowned Field and Stream outdoor magazine. Through him, I was able to learn the ‘ins and outs’ of sport shooting, firearm ownership, hunting, but most importantly…SAFETY. I am currently a 22-year old college graduate, and a proud gun owner. Sport shooting, hunting and wildlife conservation have been a driving force in all aspects of my life since I was first introduced. I was thoroughly educated from day-one on the proper usage and safety procedures involving gun ownership. This form of responsibility I was allowed helped me mature into the man I am today (I believe my parents would openly agree). 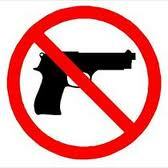 That said, I am indeed horrified by the mainstream use of firearms in entertainment, music, and video games. Our youth are becoming exposed to firearms through these avenues without any real knowledge of firearms themselves and their proper respectable uses. I also believe this includes the activity of Airsoft guns and the ensuing ‘battles’. Many Airsoft guns are designed to look like the real-thing, and do. Kids then run around pointing them at each other and pulling the trigger. While kids will be kids, and I do recognize some potential benefits of these activities, I think it is in fact doing a huge disservice. Having been a gun owner for nearly a decade, nothing scares me more than the thought of pointing one of my guns or something resembling a real gun at an individual and subsequently pulling the trigger. While I am by no means trying to be make comments on how parents should or should not conduct their parenting, I find it extremely important to understand both the benefits of firearms along with the not so pretty side which unfortunately makes the news FAR MORE often. Though this is only a fraction of my 2 cents on firearms, I hope it invokes continued dialogue and thought on the issue. I recognize I may be slightly off topic, but I whole heartedly agree that banning of certain liberties can be a very slippery slope regardless of which side of the aisle supports it. I would love to talk more, answering any questions or comments you may have. Contact me via Facebook if you’d like and I can get you my e-mail or phone number. Hi Susan, I found you via Scary Mommy (I swear and found a fellow swearer, so of course I had to pop over). Anyway, I was raised in a house without guns. I cannot shoot to save my freaking life. My husband and son are fond of guns. I resisted. When my son was young, I banned all guns toys or otherwise. At 4, my son came running down the hallway with a naked Ken doll in his hand. Ken was bent at the waist so he looked like a gun and Junior was making shooting noises. Yeah, I figured I had lost. Also, I didn’t know where he’d gotten the Ken doll. After that, Junior was allowed to have toy guns (nerf, etc.) We didn’t get him airsoft until he went through hunter safety at 11. And WTF about the the stupid biodegradable pellets? I pay more for them and they never disappear. Drives me crazy.